Lady Emily Southwell and her three friends, Priscilla Tate and Daphne and Ariadne Courdebas, are determined that someday the world will speak in reverent tones of the year they made their debuts in London Society. Lady Emily is equally determined to take her rightful place among the famous artists of the Royal Society for the Beaux Arts. That is, until her longtime betrothed Lord Robert Townsend declares his intent to marry her and whisk her off into the countryside, immediately. What can the fellow be thinking! And why is handsome Bow Street Runner Jamie Cropper dogging Lord Robert's steps, and Emily's? It's up to Lady Emily to use her art to uncover artifice and discover whether Lord Robert has something more up his sleeve than a nicely muscled arm. Along the way, a duke's daughter might just form a perilous passion for a most unlikely suitor. Lady Emily Southwell did not think like other young ladies about to make their debut in London Society. Her friend Priscilla Tate, for instance, could not stop dreaming of the elaborate ball that was to introduce them to the world. Their friend Ariadne Courdebas thought of nothing but plays, operas, and literary events they might attend, all the while worrying about how to speak to a gentleman should she meet one. Ariadne's sister Daphne, on the other hand, was already counting the number of hearts she would break as she danced the night away. According to them, Society would speak in reverent tones of the year they made their come outs. "I have decided I will not marry Lord Robert Townsend," she said as the Southwell carriage rolled through the greening countryside toward London, leaving behind the Barnsley School for Young Ladies, from which she and her friends had just graduated. Shoulder pressed against hers, Priscilla regarded her, golden brow upraised. She was going to be one of the hardest to convince. Priscilla too knew her own mind, and she was determined to make a splendid match. Very likely she would, too. All Priscilla had to do was bat those golden lashes, toss those golden curls, and the world fell at her feet. Hadn't she just inveigled a ride to London in the Southwell carriage rather than going in her father's more shabby equipage? But instant capitulation for a pout was not Emily's experience. Her looks did not command attention. Her black hair was more frizzy than curly and always worse in the rain. They had a lot of rain in England. And her nose and chin were too pointed for her to ever be called beautiful. She'd seen too many portraits to think otherwise. No, when people did Emily's bidding it was more often because they wanted to impress her father, the duke. "Don't be a ninny," Emily's aunt Lady Minerva Southwell said across from them, shifting her angular body on the leather seat. "You and Lord Robert have been betrothed since you were children, and he's been living in your father's pocket for the last fortnight. Of course you're going to marry him." Emily raised her chin. In truth, her declaration had been an opening salvo. She hadn't been certain how her friends and family would react to her intention to jilt the fellow. Indeed, she'd been rather resigned to marrying him, the knowledge that she was spoken for a constant in her life. But the dangers she'd recently braved at Brentfield Manor, helping to capture a murderess no less, had made her wonder whether marriage to Lord Robert was the right course for her. Unfortunately, she very much expected her father, the Duke of Emerson, to react the same way as her aunt, which meant she had better start planning her next move, now. "Lord Robert's activities are immaterial," Emily said. "I have other plans." Lady Minerva snorted, a far-from proper sound given that her nose was even longer and more pointed than Emily's. "Perhaps we should discuss something else," Priscilla put in with her usual winning smile. "I have had a vision about the Ball." 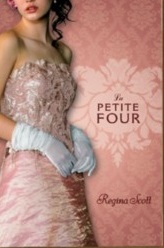 She lowered her voice and leaned forward, the glossy black feathers on her fashionable bonnet sweeping her cheek. "Goldfish." She said the word as if attempting to imbue it with mystical properties. Emily frowned. "Ah, goldfish," Lady Minerva said with a wise nod. She didn't fool Emily. She'd been wisely nodding, her gray tightly wound curls bobbing along her narrow face, since they had left the Barnsley School. Most of the time, her eyes had been closed. "Like at the Celebration Dinner with the Allies last year," Priscilla said with a look to Emily. "The Prince had streams meandering down the table and real goldfish." Emily wrinkled her nose. "The Times reported the fish died halfway through dinner! I doubt the sight of rotting fish will do much to set the sophisticated tone you so desire, Pris." Priscilla sniffed. "I'm quite certain my fish would not be so vulgar as to die before the final course." "Quite right," Lady Minerva said with another nod. "And what about finches?" Finches? Oh, but this ball would be the death of Emily! She knew Priscilla couldn't afford to have her own come out. Her side of the Tate family had never been wealthy, and now with the Dreaded Family Secret dogging her heels, it was more important than ever that Priscilla marry well. Emily had convinced His Grace that Priscilla should come out with her and given her free rein to plan the event. Invitations had already gone out to the more than three hundred people Priscilla was certain must attend. But Emily simply couldn't allow this ball to overtake more important matters. "I suppose we could set the finches amidst the roses I've ordered and have them serenade the guests," Priscilla said, one gloved finger tapping at her chin. "The theme of the Ball is an enchanted garden, after all. What do you think, Emily?" Emily shook her head. "No finches. They'd fly into someone's hair, or worse." Priscilla shuddered. Lady Minerva pouted. "Perhaps stuffed finches, then," Priscilla compromised. "Surely someone in London makes them. After all, we want this to be the most talked about event of the Season." Emily could only hope she was right. If everyone was talking about the ball, perhaps they would fail to notice that Emily had backed out of an engagement nearly as old as she was. And she could spend her time instead applying to Lady St. Gregory for admittance to that rarified air of the artistic elite. Lady St. Gregory was the President of the Royal Society for the Beaux Arts, the one trusted by the Queen to enlist new members. It was the only society open solely to members of the aristocracy. Lady St. Gregory sculpted in marble. Ariadne had read them an account of the lady's most recent work just a month ago. "A triumph of movement and emotion," The Times had said. Surely she'd see the worth in Emily's work. After all, painting was Emily's passion. She wasn't sure whether it was the heady tang of turpentine or the feathery touch of a brush that first seduced her, but some of her happiest times had been behind an easel. She often remembered the look on her art teacher's face when Miss Alexander had seen Emily's The Battle of Hastings. William the Conqueror stood high on a hill, banner waving in the breeze, while strung out around him, as far as the eye could see, lay the bodies of fallen Saxons. It had taken Emily all term to paint. Miss Alexander had gazed at it, dark eyes wide, and said, "Oh, Lady Emily, this is very, very good." Good enough, Emily thought, to grant her entrance to the Royal Society for the Beaux Arts. She was still considering the matter as they entered London, but she couldn't help a smile as Priscilla pressed her nose against the glass of the carriage window to stare at the Great City. The massive stone buildings soared into the air, blocking the evening sky. One set was gracefully classical, another heavy and pompous, a third sprawling in all directions. On each corner stood hawkers, calling for violets, penny-a-sheet newspapers, roasted nuts. Everywhere was noise, movement, color. She felt her fingers trembling and knew it was from the desire to find her sketch book. "Do you really intend to refuse the betrothal?" Lady Minerva asked after they had deposited Priscilla at her home, which Emily had been saddened to find was in a forgotten corner of Mayfair. Emily eyed her aunt. Like crows to carrion, Lady Minerva tended to show up whenever something dismal had happened. She'd cared for Emily and her older sister Helena for a short time after their mother had died when Emily was nine. She'd watched over the London house while His Grace was in Vienna trying to salvage what Napoleon had all but destroyed. It somehow seemed fitting that she had been dispatched to bring Emily home from Barnsley and chaperon her for the Season. Emily would have much preferred to have Miss Alexander beside her, but her mentor was of on her honeymoon and wasn't expected back until later in the Season. "I most certainly will refuse," Emily told her aunt. "I intend to paint. I don't want a Season, or a husband, to interfere with that. And if there is a type of woman a man expects in a wife, I am persuaded I shall never fit the mold." Her aunt harrumphed. "I shall be very interested in hearing what your father has to say about that." Unfortunately, when they arrived at the townhouse, an impressive edifice three stories tall of elegant stone with a red-lacquered door gleaming with brass, their family butler informed them that His Grace was not at home. "He's been called away by the Prime Minster, but expects to see you at dinner," Warburton promised. At least she could take solace in that. And she couldn't help the warmth that flooded her just seeing Warburton's dignified face. Their butler had been with His Grace as long as she could remember, and his hair had been white nearly that long. When she was younger, she used to think that one day she'd grow tall enough to look him straight in his bright blue eyes. She'd long since resigned herself to the fact that that was never going to happen. No one was quite as tall as Warburton. "I expect you will want to see that your room is set up to your liking," Lady Minerva said, moving toward the stairs. "Join us downstairs for dinner. You needn't dress tonight." And a lovely welcome home to you too, Emily thought, following her. What, had she imagined her father would tarry at the house just for her? He had far more important matters to tend to. And so did she. Raising her head, she climbed the stairs for the chamber story. She had never been to the London townhouse before, but she could see it was generally well appointed, though the pale green and blue paint of the walls was not to her taste. She was thankful, when she followed the footmen who were carrying the accumulated wealth of six years at boarding school up the curving stairs to her new bedchamber, to find the space much to her liking. The room was decorated in a Chinese theme, the walls covered in painted silk showing white and black birds with tall crowns and long tails. The woodwork was trimmed in gold, and gold highlighted the tall window, dressing room door, and the spindles and headboard of the four-poster bed. Even better was the fact that there was an unused bedchamber just down the corridor, where she instructed one of the footmen to erect her easel. She was just beginning to set up her paints when she heard the sound of the door. Her father must be home! She hurried along the corridor and down the carpeted stairs, but disappointment met her at the bottom, for the entry way stood empty. The footmen must already be in the kitchen preparing to serve dinner. She'd simply have to locate her father herself. Surely a quiet conversation before dinner was not too much to ask. She tried his study first. The books were neatly lined up on the tall bookcases, the papers stacked on the desk before the window. But the hearth was dark. She tried the dining room next and found it equally empty, though three places had been set in gleaming silver. She went to check the sitting room, just in case her father was entertaining a caller. This room was meant to depress the notions of any upstart bold enough to brave introduction to the Duke of Emerson. Heavy red brocaded drapes with gold-tasseled pulls covered the bow window, and red-velvet chairs with clawed feet squatted before the fire. She sucked in a breath when she sighted a gentleman standing next to them, then puffed it out when he turned and she realized it was not her father. Indeed, he looked nothing like her father. His hair was the color of the sunset on a stormy day -- red and gold and brown blending in wild disarray, and his eyes were the gray of the storm. But his smile, well, his smile was positively wicked. "Who are you?" Emily demanded, striding into the room. "What are you doing here?" He offered her a bow, cap squashed in one hand. "Good evening, Lady Emily." He knew her name? She was certain she'd never met him before. She'd have remembered those broad shoulders, that confident air. Indeed, some part of her was already making notes, of color, of strength, of fire, to immortalize in a painting. Oh, but being an artist was a burden some days! "Answer the question, if you please," Emily said, forcing her mind to the moment. "What are you doing in my home? Who let you in?" He shrugged, a ripple of muscle under his brown coat. "Your footmen are far too busy to attend to me." Emily gasped. "You sneaked in! Thief!" Small wonder she hadn't recognized him. She did not make a habit of associating with thieves. Nor did she fear them. One shout, one cry, and a small army would attend her. "Oh, there are thieves in London, all right," he agreed, as if singularly unconcerned about capture. He waved a hand to encompass the room. "You'd better watch out, or you'll lose one of these fine paintings." What fine paintings? His Grace had any number of wonderful pieces from ages past, as well as some truly horrid portraits of their ancestors. She wasn't sure which he had ordered brought to London to decorate the townhouse. But as she looked around the room, she recognized each painting as hers. The Battle of Salamanca hung over the fire, The Battle of Hastings was against the far wall, and The Battle of the Nile was to her right. It had been one of her first, when she hadn't quite mastered perspective. The British and French ships were all jumbled. He could not be much of a thief if he thought it fine art. So who exactly was he? James Cropper watched as the Duke of Emerson's youngest daughter glanced about the room as if seeing it for the first time. He certainly wouldn't have put quite so many magnificent pieces in one place, gilded frames dwarfing the walls, but then he wasn't likely to be found living in a townhouse like this one any time soon. He wasn't likely to meet someone of her note either. She was not in the common way. Her black hair stood all curly around her face as if it crackled with energy, and those dark eyes seemed to see right through him. He felt their power as her gaze speared back to him. "What do you know of art?" she challenged. He glanced out the open door. She couldn't have happened upon him at a less opportune time. Things were not going as he'd expected, and he needed to speak with Lady Minerva. But though a footman dashed past the opening, Jamie caught no sight of the elderly lady. It seemed he would have to answer Lady Emily's question, so he looked up at one of the battle scenes. That hawk-nosed general in the foreground was surely Wellington. He had the French forces in the crossfire, with heavy casualties on both sides. His charger rearing, he held his saber aloft to order a charge. "I don't know all that much about art," Jamie admitted. "But I'd say this artist never experienced war." She stiffened. "Why? What's wrong with the piece?" "Oh, the details are fine enough," he said. "I've known a few lads who served under Wellington on the Peninsula. This picture matches their tales, but it doesn't show their heart." She frowned, moving closer. "What do you mean?" She came just under his chin, a nice handful. Oh, no, my lad, best not to even think such thoughts. He returned his focus on the painting and pointed to a fallen soldier. "Look here at this fellow. He's gone down. Very likely he'll never see home or family again. He knows that by morning, crows will be picking at him. That's enough to give a man cause for thought, cause for fear. Does he look as if he's thinking about meeting his Maker?" She cocked her head, and the scent of lemon drifted up from her, reminding him of his mother's tart lemonade. "I will grant you that he doesn't look particularly emotional. But not everyone cries in adversity, sir." Something told him she'd be one who braved on without a tear. She had that militant look in her eye. "I suppose not," he said. "But I always thought art was supposed to illuminate the human condition." She raised her chin. "Some artists prefer to accurately depict history." She must certainly admire the artist to defend the fellow so fervently. "There are books enough on history," Jamie replied. "Why bother painting it if that's all you want out of it?" "Why bother?" she sputtered. "Sir, you have no sensibilities!" Jamie laughed. Odd that she found him calloused when he was accused too often of being too emotional, of taking the side of the victim when it was his job to pursue the criminal. But a noise from the corridor caught his ear, and he saw Lady Minerva heading their way, her brother the Duke of Emerson beside her. With Lady Emily standing there, looking at Jamie with a combination of bewilderment and belligerence, now was not the time to advise her aunt and father that the man they intended for her might be one of London's greatest villains. Instead, he bowed to her again. "I've picked a poor time to visit, I see. You'll want to speak to your father. He's just come home." "He has?" She hurried to the door and glanced out. Her narrow face lit, with a joy and love that wiped away all the frustration he'd felt from her. For a moment, Jamie simply stood, gazing at her, amazed by the transformation. Such a look could make a fellow forget his task, his goals, and his very self. That's when he knew he was truly in trouble.